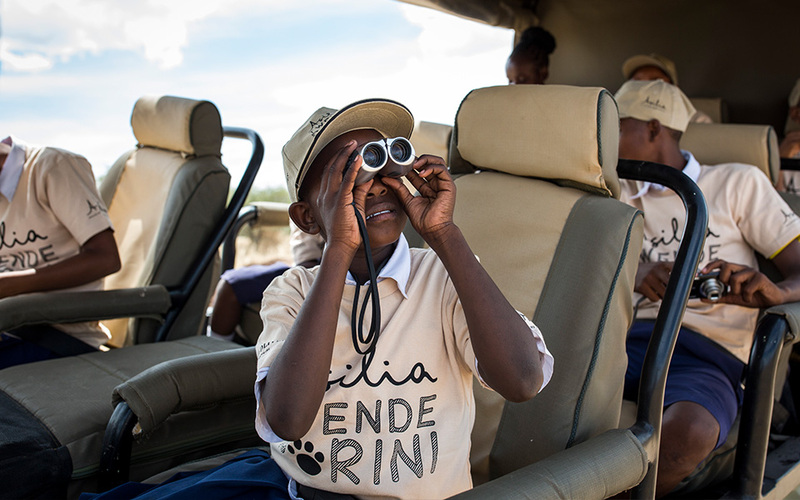 Our Twende Porini programme welcomes children from local communities to experience what a safari is all about and learn about the importance of protecting our wildlife and conserving the areas that we call home. Spending time at Little Oliver’s, the children explored the area and learnt many new things about our wildlife whilst understanding the importance of conservation – maybe one day, some of these happy faces will be guiding you on safari in the future! We spoke to our Positive Impact Co-ordinator in Kenya, Helen Schutte, about what Twende Porini means to her and why it is such an important program that is close to our hearts. Why do you feel the Twende Porini program is so important? 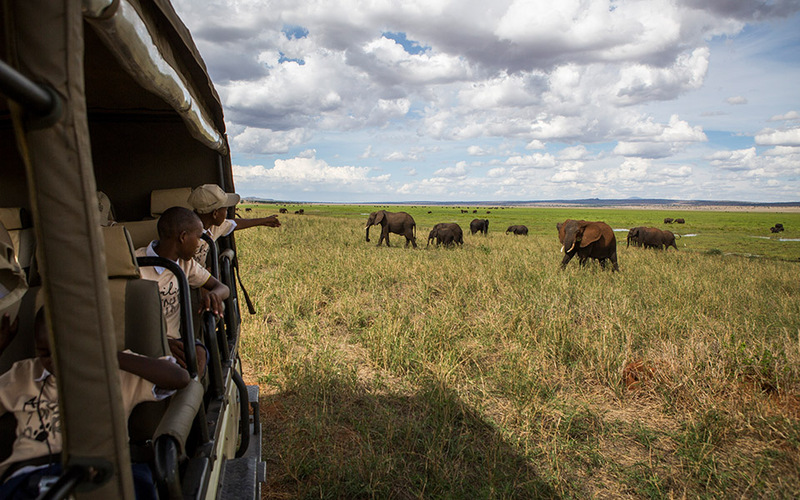 Most of the children and their parents living on the border of the Mara Conservancies and National Reserve truly have no idea why tourists come from far away to see the animals. Most of them only know the big game to be problematic, as they live in such close proximity to these creatures. Buffaloes, lions, and elephants are animals to fear rather than to admire, as they can destroy your lively hood. Local communities herd livestock such as goats and cattle, which are easy targets for the predators that roam these lands. The villager’s livestock is not only a source of food but income too so when this is threatened, human-wildlife conflict becomes a problem. Most of the people in our communities only get to see these animals in a conflict situation. By bringing children from surrounding communities out on a 4-day safari with us, they get to see the animals in their relaxed, natural state. The children have the opportunity to ‘meet’ the wildlife and learn the importance of conservation. It is always a treat to see the children’s reaction when they see their first lion or elephant on a game drive – they normally first try to hide from it – underneath the seat or hiding underneath their Masai blankets by putting them over their heads! But soon learn they are safe and are then just amazed by the experience. It is really incredible to be able to bring these kids as guests to our camps. The entire team, from the mentors, camp staff, to the Positive Impact partners, enjoy spoiling the kids with 3 proper meals a day, loads of fun and games and also teaching them about the magic that is right on their doorstep. The message of why it is so important that we all work together to protect the areas and wildlife is told to the children. These special places in Africa should be enjoyed not only by them but also their children, grandchildren, and beyond one day. Twende Porini is such an eye-opener to these children – it makes them excited about wildlife, the conservancies and what we try to do as Tourism Partners. It is truly an investment in the future custodians of this land. What is your favourite memory of the previous Twende Porini trips you have been on? I have only joined one Twende Porini trip, but the excitement and enthusiasm showed from the children about the entire experience will always stay with me. One of my personal highlights was the response from our staff: they had a camp full of 30 children that they had to take care of, in the mud and rain, it was very challenging weather. Despite this, the camp was always clean and neat, all of our laundry was done on time and the food was incredible! Everyone jumped in to help where they could, and in their rest time they would come and join in on the games and fun. The team’s feedback was only positive and full of amazement at how Asilia gives back to these children and the communities – they did not even think something like Twende Porini was possible! The fact that the people who worked the hardest enjoyed and appreciated it this much is a memory that will always stay with me. Have you seen a difference in the way children, families, and communities work with others and in the way they view conservation and wildlife in their areas? In the Mara, and especially in the conservancies, this is a continuous process of working with our communities through our Positive Impact partners to change peoples perception of conservation and to educate them as to why it is important and how they truly are benefitting every single day, directly or indirectly, from the conservancies. What I do know is that school children are chanting “Twende Porini” with great excitement whenever they see an Asilia car passing through Aitong, one of the most central Masai towns. This is truly heart-warming and shows that the message must be spreading.